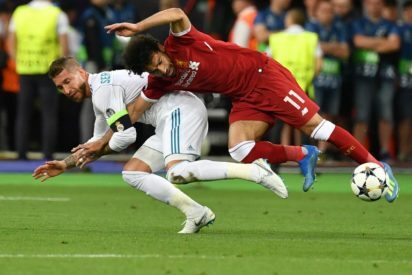 Real Madrid defender, Sergio Ramos has found himself the target of a petition that has called for him to be “punished” after forcing Liverpool’s Mohamed Salah out of the Champions League final. Ramos is not exactly a stranger to widespread loathing outside Madrid, thanks to his abrasive style both on and off the pitch. Now a change.org petition that has already garnered more than 100,000 signatures wants UEFA and FIFA to take action. “Sergio Ramos intentionally kept Mohamed Salah’s arm under his armpit, causing dislocation of his shoulder. Not only missing the rest of the game, but also missing the FIFA World Cup 2018,” the petition’s author ‘Mohamed Salah Abdel-Hakeem’ argues.